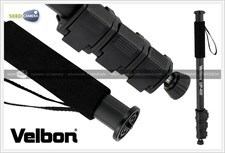 The Velbon UP-400DX Video Monopod is a lightweight camcorder support with an integrated tilting video head. The four sections of the UP-400DX extend to a maximum height of 66.5" and retract to 22.4" for easy transport or storage. The removable pan bar controls the front-to-back tilt of the head, and it can be employed to rotate the monopod at the foot for panning. The head's tilt action features a measure of resistance for a fluid effect, ensuring this movement is not haphazard or jerky but rather deliberate and smooth. The back-to-front tilt range is -45 to 90°. 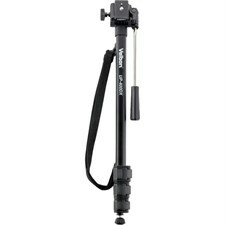 The monopod head is matched with a QB-4L quick-release plate, which is longer than typical quick-release plates that are designed for still cameras. 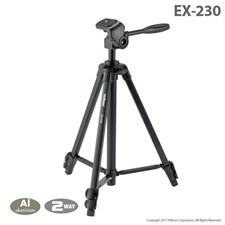 It features a video pin for extra camcorder stability. 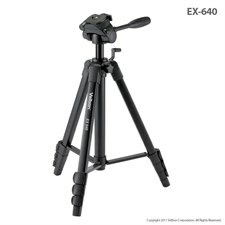 On EX 430 and higher, the camera plate turns to the right instead of left. This leaves left hand free to adjust tripod and camera controls while taking images in portrait mode.